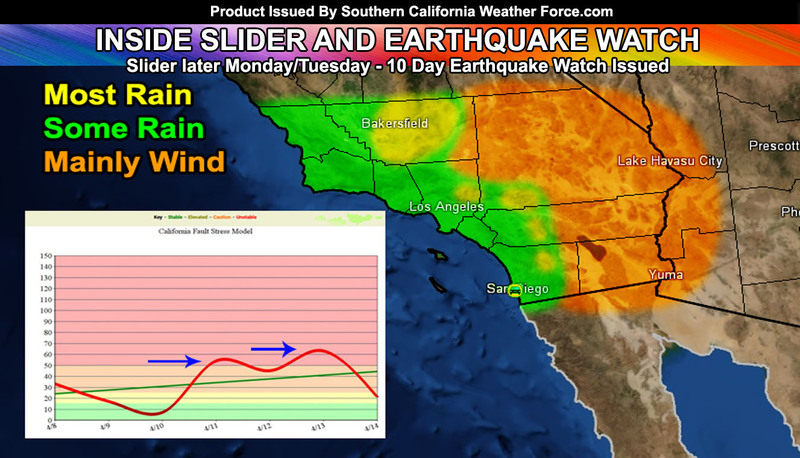 An inside slider will move across the southland later Monday into Tuesday, generating some rain, but mostly wind for many areas. The Earthquake Watch for the state has also been issued so read on for details. This inside slider will act similar to the ones we had this mid-month already with a glancing blow to the region, bringing more rainfall fo areas of San Luis Obispo and Kern County than the metros of Ventura, Los Angeles, Orange, San Diego, and the Inland Empire Zones. Later on Monday, a front will drag across Sa Luis Obispo to Kern County, generating a round of rainfall there. Rainfall estimations on the Southern California Weather Force rainfall model show over a quarter of an inch of rain in the city of Bakersfield. For the rest of the region, expecting the surface low developing over Nevada to generate a strong onshore flow that will bring upslope on and off rain showers to most metro areas and possibly even some High Desert zones. It is expected to be light, however. The most in the ‘metros’ will fall along the south and west facing mountain zones of the Santa Barbara, Ventura, Los Angeles, San Bernardino, Riverside and San Diego County Mountains, the most from that list in the San Bernardino Mountains surrounding the Rim, Oak Glen, Yucaipa and Banning zones, which is pretty normal for these types of inside slider patterns. Wind gusts will in the mountains and deserts later Monday into Tuesday will be in the 40-50 mph range while the metro zones away from them being in the 30-40 mph range. Still, expect gusty winds out there in widespread inside slider fashion. We will see some 60+ mph winds on the Eastern Slopes of the Kern, Riverside, and San Diego County Mountains, however. As for the Earthquake Watch. Over the last few days, we have been seeing the algorithm and trend line moving up, with a peak on the 13th of April separated by another peak on the 11th. This type of pattern does correlate with issuing an Earthquake Watch for a 4.0 or higher shaker in the state of California or Baja Mexico (close to the region) with a window of 10 days from this article issuance. Watches in the past have come up with a success on similar peak patterns. Should it happen anywhere in the watch area it will be considered a hit, even if Southern California is not the epicenter. It must occur anywhere within the state of Baja, Mexico close to our region for it to be a successful watch issuance. 0-10 day window starts today, April 14, 2019. After the inside slider, we will hit the 90s for a brief period of time for the end week on your Thursday with warm temperatures (not as hot as Thursday) into Friday. A cool-down is expected ahead of another inside slider expected on Easter Sunday. It’ll renew the colder temperatures that weekend along with light precipitation chances. The Coachella Music Festival will again have another comfortable weekend with nice temperatures and nominal wind gusts. This could be the best two weeks for that festival in many years. Tuesday will have the highest amount of wave activity with 8-10 foot individual waves being likely under strong westerly winds. We will have a couple more inside sliders before the month’s end happens and end the month at an ‘overall’ average of below average to average temperatures, which does fit the April 2019 forecast for temperatures.